This is my go-to dish any time I have to house to myself. My husband hates mushrooms. I hate cold weather. That’s why this is the perfect dinner to make, for myself, while he and the kids are out skiing. I absolutely love mushrooms. I’ll eat them any way I can get them; sauteed, stuffed, grilled, or raw. I especially love the earthy, woodsy flavor of the baby bella (or cremini) mushrooms used here. My husband would gag if I served this to him. But don’t get me wrong, he’s still a fun guy (get it?). Put a pot of water on to boil. 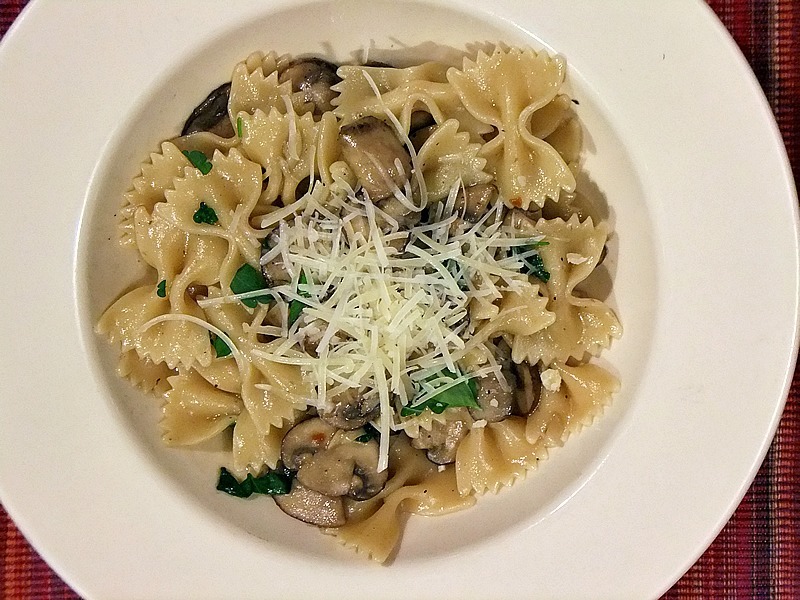 You’ll want to time this so you can cook the pasta while preparing the mushroom sauce. Heat olive oil in a large saute pan over medium heat. Add the garlic and cook for 1 minute. Next, add mushrooms, salt, and pepper to the garlic and cook for about 3 more minutes. Add the wine and increase heat to medium high. Let the wine reduce. 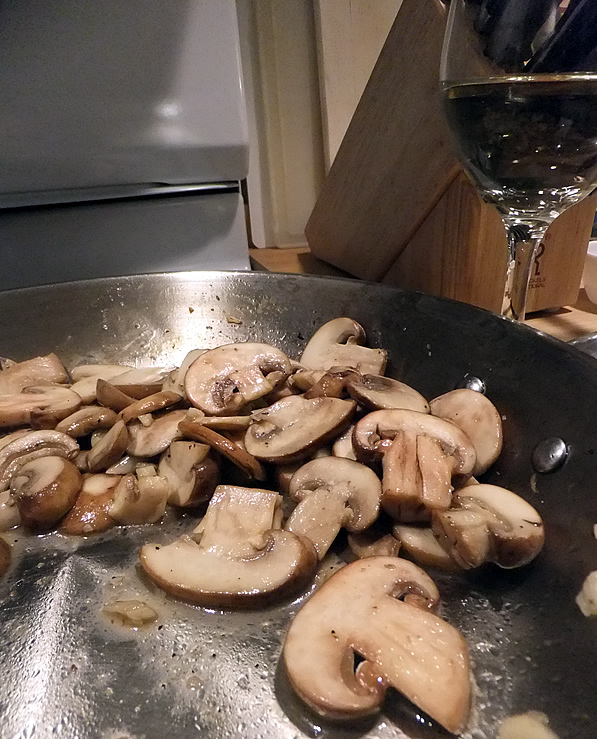 Once the wine has reduced, add the prepared broth and let it all cook at a low simmer for about 10 minutes. Also, your pasta should be cooking during this time. Drain the bowties once they are al dente. 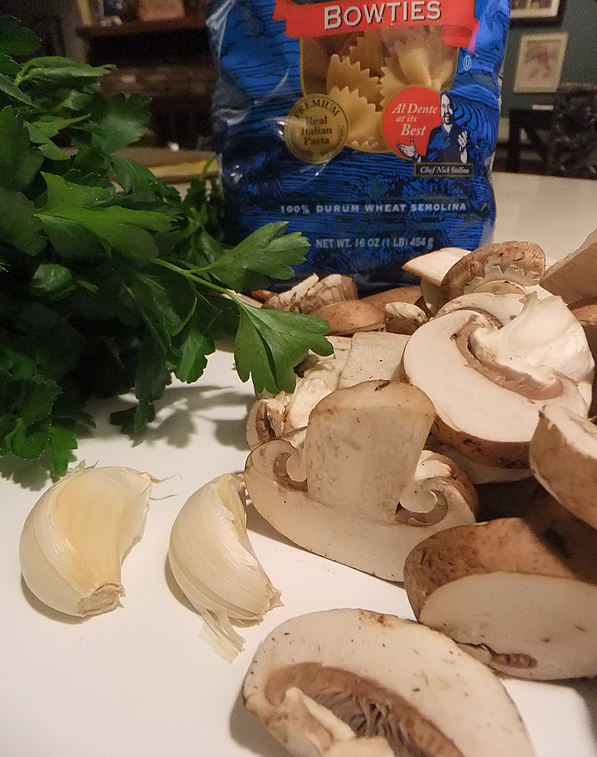 Mix the cornstarch into the cold water* and add to the mushrooms along with the parsley and red pepper flakes. Stir together for about a minute and remove from the heat. Toss the cooked pasta together with the mushroom sauce, top with Parmesan and enjoy! Serves two (or one lonely, mushroom-lovin’ gal with leftovers). *Sometimes I skip the cornstarch. The result is equally good without it, but you’ll want to use it if you prefer a thicker sauce.